The article describes the current state of Internet access and its usage in Rajshahi University, the second largest pubic university in Bangladesh. The study used a questionnaire-based survey method to investigate the infrastructural facilities for Internet access and to know the patterns of Internet use in all the 47 departments of 7 faculties, 5 institutes, computer centre, central library and administrative building of the university. Although the university community is deriving some benefits from internet access, the study revealed that nearly half of the responsible authorities of the various sectors are not satisfied with the existing facilities owing to several constraints. On the basis of the prevailing situation, this article suggests future directions for better Internet access in the common interest of the university community. Keywords: Internet access, ICT, Public University, Rajshahi University, Bangladesh. Bangladesh, located in South Asia, bordering the Bay of Bengal, between India and Myanmar, is one of the overpopulated, underdeveloped and technologically backward countries in the world. Like other developing countries, Bangladesh was late in introducing Internet technology. The Internet came in Bangladesh through UUCP (Unix-to-Unix copy) email connectivity in 1993 by Pradesta Ltd. and IP (Internet Protocol) connectivity in 1996 (Rahman, 2002). Online Internet service began in June 1996, when VSAT (Very Small Aperture Terminal) was legalized to operate as Internet Service Provider (ISP) in the country’s private sector. Since then, there has been much talk about the use of Internet in industry, business, communication, education, research, and in every other sphere of life. But the Internet penetration rate in Bangladesh is as low as 0.2%, compared to Thailand 9.3%, Maldives 5.2%, Vietnam 4.2%, India 1.7%, Pakistan 1.0%, and Sri Lanka 1.0% (Internet World Stats, 2004). The higher academic institutions of a country are pioneers in adopting and using Information and Communication Technologies (ICTs). At present, there are 26 public and 54 government approved private universities in Bangladesh, and many of them have Internet access. Only two universities, Rajshahi University, and Shahjalal University of Science and Technology, Sylhet have their own VSATs. Many public universities, like Dhaka University, the Bangladesh University of Engineering and Technology (BUET), Jahangirnagar University, the National University, Bangladesh Open University, Chittagong University, Khulna University, the Islamic University, etc. have leased lines, while Bangladesh Agricultural University, Bangabandhu Sheikh Mujibur Rahman Agricultural University, and Sher-e-Bangla Agricultural University are connected to the Sustainable Development Networking Programme (SDNP), a specialized project of the United Nations Development Programme (UNDP). Rajshahi University, instituted in 1953, is a public university located in Rajshahi Metropolitan City, nearly 300 kilometres from Dhaka, the capital city of Bangladesh. The university is considered the second oldest and largest university in Bangladesh. The University has 303.80 hectares of campus areas, 8 faculties, 47 departments, 5 institutes, 9 affiliated institutes, 11 academic buildings, 16 residential halls, 1,040 teachers, and approximately 25,000 students. (University of Rajshahi, 2006). The university formally launched Internet in April 2000 through a Rajshahi-based local ISP, Three Sons Ltd. establishing a fibre optic backbone-based Local Area Network (LAN). The campus-wide Internet infrastructure was developed under the National Science and Technology (NST) project of the Ministry of Science and ICT, Government of the Peoples’ Republic of Bangladesh with total budget of Tk. 2.5 million. The project started in 1999 and ended in 2000. Prior to that the university computer centre started to provide teachers and researchers with only offline email facilities on NWD (Nation Wide Dialling) phone lines connected to ISP servers at Dhaka in 1997, as there was no ISP in Rajshahi till then. In 29th October 2002, the University launched its own VSAT (Very Small Aperture Terminal) with the special donation of Tk. 5.8 million by the government. It is worth mentioning here that Bangladesh connected to the global information super highway with inauguration of the submarine cable by the Prime Minister of Bangladesh on the 21st May 2006. The South East Asia-Middle East-West Europe-4 project connects the country with undersea fibre-optic cable passing from Singapore through Malaysia, Thailand, Bangladesh, India, Sri Lanka, Pakistan and a number of Middle-Eastern countries to finally land in France. Now the county will have a 10-gigabyte data-transfer capacity per second, 68 times higher than the current speed. (The Daily Star, May 22, 2006). It is thought that this will be a landmark development of the current Internet access scenario of the country in general, and Rajshahi University in particular. Suggest certain future directions for easy and effective access to the Internet in the campus. There have been few studies of Internet access in Bangladesh. Most of them relate to overall Internet access, its growth, usage, impacts, barriers, and position in Bangladesh. Azad and Islam (1997) give an overview of Internet access including the status of telecommunications in Bangladesh, launching of online Internet, current rates for online Internet access, providers' views, major Internet users, impacts and barriers, etc. They explore high service charges by the providers, poor telecommunication system, government policy, and low buying power of potential clients as major barriers to Internet access in Bangladesh. Press (1999) describes the emergence of the Internet in Bangladesh with its various dimensions and constraints. He remarks that, as in many developing nations, the Bangladeshi Internet is hobbled by poor telecommunication infrastructure, lack of computing and networking equipment, few human resources, and an indifferent, bureaucratic government. Iqbal (1999) presents the background and growth of the local Internet, problems encountered by ISPs, and the role of the Bangladesh Telegraph and Telephone Board (BTTB). He also provides some suggestions for improved Internet access in the country. Rahman (2004) describes the present situation of Internet access in Bangladesh, the dimension as well as the potential of Internet business, and problems of Internet access. The present work, primarily a case study, used a combination of both qualitative and quantitative approaches. The study reviewed the relevant literature published in books, journals and websites. The research conducted a survey of all the 47 departments of 7 faculties, 5 institutes, the university computer centre, the central library and the administrative building to examine overall Internet access and its present position in Rajshahi University. The Faculty of Medicine was not included in the study because it comprises several medical colleges in the region located outside the university main campus. The study also excluded the Rajshahi University School and College, the halls of residence, the university guesthouse and club, the medical centre, the physical department located in the campus, as they were not connected to the Internet. Table 1 lists the surveyed units of the University. A structured questionnaire was designed, copies of which, were sent to all the concerned sectors. The respondents were the chairpersons of the departments, directors of the institutes, and the responsible authorities of the offices concerned. In some cases, to ensure the authenticity and clarification of data, an unstructured interview method was adapted. The survey was conducted between June and July 2005. The data collected for the study were statistically analyzed. Faculty of Life & Earth Sc. The total length of the fibre optic backbone-based campus LAN is 9 km including 1 km of UTP (Untwisted Pair) cable. The LAN equipments are: i) Master Backbone Switch – Intel 550 F, and ii) Network Switch (including Fibre Port) – Intel 510 F. The LAN covers major academic buildings including departments and institutes, computer centre, central library, and administrative building. Both the LAN access and Internet access were going together. It is found from Table 2 that among the 58 study units, 51 (88%) were connected to the LAN as well as to the Internet. Of the 51 LAN and Internet connected Units, 13 (25%) were under the Faculty of Science followed by 9 (18%) Social Sciences, and 7 (14%) Arts, while 5 Units (10%) were under each of the Faculty of Business Studies, Faculty of Life and Earth Science, and under the institutes. Three units (6%) were under the Faculty of Agriculture, and each of the Faculty of Law, computer centre, central library, and administrative building had 1 (2%) units connected to the Internet. The University installed satellite ST-1 linked with Singtel Company of Singapore. The VSAT performs bi-directional operations- sends (uplinks) and receives (downlinks) information, and supports multiple interfaces available for LAN. The overall bandwidth of the VSAT is downlink (DL) 512 kbps and uplink (UL) 128 kbps. After introducing VSAT, it becomes easy to access, browse, download, upload, email, etc with faster than earlier ISP-based connection. The University has 5 servers including 3 brand servers (two HP and one IBM), and two normal PCs used as servers maintained by the university computer centre. These include: Proxi server, DNS and Mail server, Web server, DHCP server, and the Gateway server- all are used to run the VSAT. The study finds about 750 PCs at different locations of the university among which 390 (52%) had both LAN access and Internet access (Table 2). The Faculty of Science was again on the top of the list having 120 (30.8%) Internet access PCs, followed by the Faculty of Life and Earth Science 71 (18.2%), computer centre 50 (12.8%), Institutes 40 (10.2%), the Faculty of Social Sciences 37 (9.5%), Business Studies 26 (6.6%), and the Faculty of Arts 13 (3.3%). Ten (2.6%) PCs had Internet access facilities in each of Agriculture Faculty, central library, and administrative building, while only 3 (0.8%) PCs had such facilities in the Faculty of Law. The university has a digital telecommunication network. The network covers the entire campus area including all academic buildings, administrative buildings, central library, other offices and residences. The university has both direct and PABX connections. The telecommunication network was used to provide dial-up connection in one or two locations within the campus outside the LAN facility. The university has a plan to extent Internet access to the residences of the teachers and officials using dial-up connection. The university has its own web site (http://www.ru.ac.bd) created by the computer centre. The university web site contains the general information about the university, its faculties, institutes, departments, library, publications, admission, etc. along with the publication of some special events like the circulation for admission, application forms, the result of admission tests, important current issues, and so on. The study reveals that only 13 departments (28%) and 1 institute (20%) developed their own homepages containing general information about the departments or institutes. In almost all cases, the departmental or institutional web pages were not used to publish specialized information like ongoing researches, academic results, seminar or workshop information, even they were not regularly updated. The University Computer Centre, located on the 2nd floor of the First Science Building with floor space of 5,000 sq ft including lab area of 1,600 sq ft. was established in 1985 with a system of Alpha Micro. The centre is administered and managed by one administrator, two senor programmers, and two senior computer operators, and other non-technical personnel. The campus wide fibre optic LAN, VSAT, servers, and university web site are maintained by the computer centre. The centre has a computer lab with 50 Internet access PCs. The lab is connected to other Internet access PCs at various locations within the LAN. The centre provides teachers, research students-mainly masters thesis, M.Phil, and PhD students, and non-academic staff with computer and Internet access facilities. It also offers short term training programmes on computer application, use of Internet, and application of various packages to all categories of users. The University Central Library was established in 1955 to provide students, teachers and researchers with required library resources, facilities and services to satisfy their academic and research thirsts. At present there are about 3,00,000 reading materials including books, journals, documents and reprints. The library is housed in a three-storied magnificent building. As a part of future automation plan, library has established a computer cell with Internet access PCs, started to create and maintain some bibliographic databases of thesis, dissertations and journals using CDS/ISIS software. Its air-conditioning system is in the pipeline. But the library resources, facilities, and databases are not on the Internet. Recently, the library has initiated subscriptions to online journals via the Programme for the Enhancement of Research Information (PERI), through which resources can be accessed within the university network without any password. Prior to that the Central Library did not have any licensing agreement with publishers to subscribe e-books or e-journals. In fact, users at various locations used e-books and e-journals by their personal arrangement. The library attached to the university website has active homepage with only journal option. PCs are being used only for official purposes, and still now the library do not have any facilities to allow users to access the PCs and Internet; although the authority is formulating policies for users to provide them access very soon. In addition to the central library, there are seminar libraries in almost all departments, institute libraries, faculty libraries, and the libraries of halls of residence. The central library allocates budget for these libraries to acquire books, journals, and reading materials. The resources of these libraries, which are the property of the central library, are catalogued and processed by the central library staff and inspected periodically by them. None of these libraries have Internet access facilities. Computer laboratory refers to a room or a place designed to organize and maintain computers, where users have access to both the computers and the Internet. 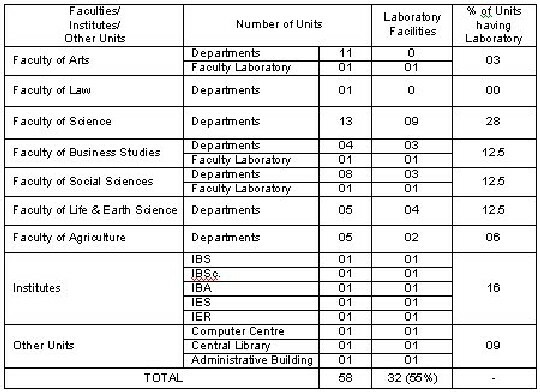 Table 3 shows that of the 58 units, 32 (55%) had laboratory facilities. Among the units having laboratory facilities, 9 (28%) were under the Faculty of Science followed by the Institutes 5 (16%). All the institutes, computer centre, central library, and the administrative building had computer laboratories. Each of the Faculties of Business Studies, Social Sciences, and Life & Earth Science had 4 (12.5%) units with laboratory facilities. The Faculty of Agriculture had 2 departments (6%) with computer laboratories, while no departments of the Faculty of Arts and the Faculty of Law had their own laboratories, although the office of the Arts Faculty maintained one computer laboratory for the teachers. The total campus area network was centrally managed and financed by the university. The university had to pay bandwidth charge of monthly Tk. 0.15 million to Singtel, Singapore. No departments, institutes, or individuals within this network had to pay for using the Internet. Sometimes the university allocated a limited budget for the departments, institutes, or other sectors of the university to buy computers and technological peripherals. Often the departments or institutes had to purchase computers and accessories from their internal funds. Table 4 reveals that 27 (47%) Units (25 departments and 2 institutes) introduced some kind of IT-related courses in their syllabi either at Honours or Masters or both levels of education. Of the 27 Units, 8 (30%) were under the Faculty of Science, while 4 (15%) under each of Social Science and Business Studies faculties, followed by 3 (11%) under the faculties of Arts, and Life & Earth Science respectively. Two units (7%) introducing IT-related courses were concerned to each of Agriculture Faculty and of the Institutes, and the rest 1 (4%) unit was under the Faculty of Law. In general, only 6 departments covered more than 15% marks of their total syllabus for IT-based courses, while 18 departments introduced one or two IT-oriented fundamental courses. Fundamentals of computers, data communications, fibre optic com., satellite communication, network, e-commerce, etc. with various aspects of Internet and its application. Basics of computers with its business application including accounting, finance, information management, e-business or e-commerce, etc. Fundamentals of computers, and their application according to subject requirements. Computer fundamentals with subject consideration. The courses are usually designed by the Committee of Courses of the departments, and Board of Studies of the institutes, and finally approved by the university authorities. There was no consistency among the courses ranging from simply fundamentals of computers to more advanced applications of ICTs with subject relevancy. The study finds some aspects of Internet and its use included in various courses like computer fundamentals, data communications, networking, e-commerce, etc. But no major Internet courses were found in the syllabuses, except the department of Library and Information Science of Social Science faculty which introduced ‘Internet Studies’ in its honours syllabus along with automation, database, networking and resource sharing, systems analysis and design, hardware maintenance and trouble shooting, software application, etc. Moreover, the university computer centre conducts a short-term training course on Internet application for the students, teachers and officers. On the basis of the data provided in the questionnaire, 820 were calculated as academic staff and 650 as non-academic staff working in various departments, institutes, and offices. Here, ICT-background manpower refers to those who have short term Certificate, Diploma, Bachelor, or Masters in computers, or any stream of ICTs. The research indicates (Table 5) that among 820 academic staff working in various departments and institutes, excluding those who were on study leave, only 139 (17%) had ICT background knowledge. As can be seen from Table 5 and Figure 1, majority of the ICT-background academic staff (59%) were employed by the faculty of Science. The other 41% were involved in the faculties of Life & Earth Science (12%), Social Science (10%), Arts (07%), each of Business Studies and Agriculture (04%), and Law (01%), and in the institutes (03%). The reasons for the high proportion of ICT-background teaching staff in the faculty of Science were that the Faculty includes the departments of Computer Science and Engineering, Information and Communication Engineering, Applied Physics and Electronic Engineering, etc., which employ more IT-background academics, and offer more IT-related courses of studies. Besides, of the 650 non-academic staff (including officials at 1st and 2nd grade, excluding employees at 3rd and 4th grade), only 33 (05%) were found to have ICT-background or some kind of ICT-knowledge who were engaged in 13 departments, 2 institutes, computer centre, central library and administration. Majority of the departments 34 (72%), 1 institute, and the central library did not have any computer operator. Computer operators are those computer literate people, who are employed against the post of ‘computer operator’- one of the designated technical posts of Rajshahi University, to operate, use and maintain computers for official dealings. Teachers, students, and administrative staffs were identified as computer and Internet users in the campus. The study finds that (Table 6) all units except administrative building (98%) provided teachers with computer access facilities. Teachers also had Internet access in all net connected units excluding administrative one (86%). Mainly research students (Masters, M.Phil, and PhD) could have access to computers and Internet for practical and research purposes in 23 (40%) and 14 (24%) units respectively. General students had limited access to computers and Internet in some of the departments, institutes, and faculty labs. Administrative staffs had computer access in 38 (66%) units and Internet access in 19 (33%) units. It is found from Table 7 and Figure 2 that among some common Internet resources and facilities, e-mail and web browsing were most popular, being used by all the concerned sectors (100%) of the university. The next significant usage was FTP (mainly downloading, in some cases uploading), used in about 76% of the units, somewhat larger than Electronic Books and Journals (about 71%). The percentage was remarkably declined in case of IRC, being used in only 15 (29%) units, followed by Newsgroup in 9 (16%) units. Both were mainly used in some of the departments and in computer centre. Internet Audio-video was used by 6 (12%) of the concerned sectors, mainly by some of the departments. Some other common and advanced applications of Internet like Bulletin Board, Internet telephone, Internet radio, etc. were largely being ignored due to lack of sufficient knowledge on Internet and official restriction. Among the Internet application software available, Internet Explorer was remarkably used by all the sectors (100%) of the university. Other software was less used including Netscape Navigator (24%), and MSN Explorer (14%). The most commonly used search engines and tools were Yahoo, Google, AltaVista, Eudora, and Hotmail for emailing and searching information. Of the 58 respondents, 56 (almost 97%) claimed that they were using both Yahoo and Google either for email or for searching while 31 (53%) used AltaVista, 25 (43%) Hotmail, 20 (34%) Eudora, and 22 (38%) used others including some local and international search engines. Centrally, the university had no recognized policy for using computers or Internet. Only 16 departments (34%), 1 institute (20%), and computer centre reported to have their own policy related to the terms and conditions of computer laboratory use, Internet accessibility, time schedule, type and extent of facilities to be enjoyed, specification of user group, specification of fee-based facilities, and so on. The computer centre, as for example, issued one-year duration ID card only for research students to use computer laboratory. But the teachers and administrative staff had open access to the laboratory without any ID card. Users could print multiple copies with own papers and printer ribbon. The laboratory remains open from 8.00 a.m. to 8 p.m. for all type of users. But such systems vary from one unit to another. In fact, there was no standardization or consistency among the policies. The rest of the departments and institutes, the central library, and the administration were using computers and Internet without having any approved policy. Table 8 lists some common Internet access benefits, and options were given to answer more than one item. It is found that all respondents (100%) identified Internet as a platform for online communication most commonly via e-mail, while 91% considered Internet as a tool for academic and professional excellence. About 90% respondents mentioned that Internet facilitated them to access a wide range information sources including e-books, e-journals, digital theses and dissertations on diverse subject fields. Another benefit indicated by about 76% authorities was the access to basic and general information of different universities in home and abroad which would help them to know other universities, their institutes, schools, faculties, departments or disciplines, course curriculum, education system, research, degrees offered, enrolment procedure, scholarships, staff, students, etc. Almost 74% respondents considered Internet as a valuable guide for a wide range of local and overseas scholarship and fellowship programmes, while 62% described Internet as an important source of various national and international seminars, conferences, workshops, and training programmes related to their area of interests. About 36% authorities replied that Internet helped them to access to some local and foreign library systems and services on a limited scale. Other benefits include reading daily newspapers, publishing web pages, articles and results, as indicated by 45% of the respondents. A source of seminar, conference, and workshop info. Figure 4 presents major Internet access constraints according to their ranks. The most significant problem was the lack of sufficient computers and accessories, identified by 81 percent of the respondents. Almost the same proportion (79%) of respondents identified financial inabilitiesto buy computers and related technologies and to maintain lab facilities for both teachers and students as a major constraint. Thirty-seven respondents (64%) expressed their opinions about the lack of IT-literate people, while 35 (60%) reported having acute space problemto organize computers and Internet technology in their departments or institutes, and 32 (55%) remarked that computer-processing speed was not at a satisfactory level, so they had to spend more time for accessing, browsing and downloading. Interrupted power supply was another constraint for proper utilization of computer and Internet access benefits in the campus as identified by 26 (47%) authorities. Besides, 12 (21%) respondents identified their ignorance about Internet resources, lack of latest computers, finding suitable time to use limited computers, etc. as problems of Internet access and its effective use. Of the 58 respondents, 52 (about 90%) indicated their level of satisfaction, while 6 (about 10%) did not have any comment on this point. Figure 5 presents that 26 (45%) of the concerned authorities were not satisfied because of the insufficiency of the present Internet access facilities in the campus. Fourteen (23.6%) respondents expressed their satisfaction to some extent regarding the use of Internet, especially for official and personal dealings, while 12 (21%) were pleased with sufficiency of the existing Internet services and facilities. It is not wise to expect the maximum satisfaction level within limited resources, and hence, we must appreciate what Rajshahi University has done by introducing own VSAT-based optical fibre LAN in the campus. There is no doubt that the Internet has brought a great change in the nature of functions and activities in different sectors of Rajshahi University. Academicians are increasingly dependent on the Internet day by day. But as reflected in the present research, the Internet access facilities in Rajshahi University are not at a satisfactory level. On the basis of the situation of Internet connectivity and accessibility in the campus, certain recommendations are made for future considerations. The campus LAN should be extended to cover all academic buildings, teachers’ and students’ dormitories, medical centre, physical department, and other offices to ensure more connectivity and more accessibility. Initiatives should be taken to enhance the present bandwidth of VSAT data circuit so that the faster data transmission and quick access to Internet can be provided. Many authorities were not satisfied with the present services of the university computer centre. The university should establish a full-fledged cyber centre equipped with a good number of latest computers, modern lab facilities with sufficient space to accommodate more users, and major Internet access services to meet the customer demand. All faculties, departments and institutes should be provided with sufficient computers and accessories to develop independent computer laboratoriess with Internet connection as well as to ensure more access facilities. The university authority should take a long-term plan to create Internet access opportunity for general students. Initially, the authority may introduce some Internet services for the students with minimum charge. The departments and institutes should equally be provided with sufficient budget, and even special allocations only for ICTs on a priority basis. As optical fibre network appears to be expensive, the university authority should adopt fund-generating activities along with government allocation. Provision should be made to appoint ICT-literate and skilled manpower in different sectors of the University. Besides, the university should organize special training programmes on various aspects of ICT for the teachers, officials and students for proper utilization and maintenance of computer and Internet technology. Approved policies concerning the terms and conditions of using and maintaining computer/Internet by the departments, institutes or offices must be developed. Moreover, the university should centrally formulate a standardized policy for proper implementation of the campus area network. The departments, institutes, and faculties should develop their websites to publish their own departmental, institutional, and faculty information with special and current events. Besides the common Internet access services, the authority should introduce some special type of facilities and value added services like- Internet telephony, fax-to-fax and voice over IP, etc. Interruption of power supply has become a common problem in Bangladesh. The university should take initiatives to ensure uninterrupted power supply within their capability so that Internet can be used without any hazard. The implementation of the suggested measures would ensure maximum utilization and benefits of the campus network. But it is beyond the university’s means to implement all the measures at the same time. Therefore, a step-by-step priority-basis plan should be taken to make the recommendations more realistic and successful. There is no doubt that currently we are witnessing a new global information age, which is being influenced directly by Internet related developments. As an important tool for information and communication, the Internet plays a dynamic and multifaceted role in higher education and research. The use of the Internet for teaching and learning purposes has received increasing attention over recent years (Hong, Ridzuan & Kuek, 2003). Considering the multifaceted and dynamic role of the Internet, universities of all sizes and types are now connecting to the web and thus providing myriad Internet facilities to students, teachers, researchers and officials. Rajshahi University is one of the leading higher academic institutions of Bangladesh that has positively begun to take advantage of this superior technology for her large population. This is a dynamic and realistic effort and achievement of Rajshahi University, which has brought changes in the attitudes of the academics to their information and communication needs. The study revealed that a high percentage of the authorities expressed their dissatisfaction with the present Internet access facilities in the campus due to the obstacles described earlier. Nevertheless, by virtue of Internet adoption, the members of the university community are becoming smart users of the world information system, and getting some important Internet access benefits and services. But at the same time there is a broad scope for further improvement of the situation prevailing. For the successful implementation and use of the Internet, a set of technical, operational, and management skills are necessary (Bazar and Boalch, 1997). Therefore, provision should be made to develop manpower for competitive IT environment. If the university authority seriously considers the research findings and makes effective plan for the implementation of the suggested measures, it may be possible to realize the full advantage of the optical fiber network on the campus. The overall Internet access scenario and its utilization in Rajshahi University as reflected in the study would help the concerned authorities to develop a country wide Internet infrastructure for the universities in Bangladesh and to ensure realistic use of this technology in the modern education system. Azad, Abul Kalam and Islam, Nazrul (1997). Overview of Internet Access in Bangladesh: Impact, Barriers, and Solutions, at http://www.isoc.org/inet97/proceedings/E3/E3_1.HTM, accessed 12 September 2004. Bazar, Bayaarma and Boalch, Gregg (1997). A Preliminary Model of Internet Diffusion within Developing Countries, AusWeb97 Third Australian World Wide Web Conference, 5-9 July, Lismore, NSW, at http://ausweb.scu.edu.au/ proceedings/boalch/paper.html, accessed 12 June2004. Hong, K. -S., Ridzuan, A. A., & Kuek, M. -K. (2003). Students' attitudes toward the use of the Internet for learning: A study at a university in Malaysia. Educational Technology & Society, 6(2), pp.45-49, at http://ifets.ieee.org/periodical/6-2/5.html, accessed 7 May 2004. Iqbal, S.M. (1999). Internet in Bangladesh: State of Art and Changes Needed to Prosper. Bangladesh Internet Country Paper presented in Workshop on Internet: South Asian Realities and Opportunities, Dhaka, April 5-8, at http://216.152.71.161/Bangladeshinternet.html, accessed 25 December 2004. Internet World Stats: Usage and Population Statistics (2004), at www.InternetWorldStats.com, accessed 25 July 2004. Nasiruddin, Mohammad (2003). Internet Use by University Academics: A Bipartite Study on Information and Communication. Online Information Review, Vol. 27, Issue 4, April, pp. 225-237. Press, Larry (1999). Against All Odds, The Internet in Bangladesh. The MOSAIC Group, Fairfax, VA, March, at http://som.csudh.edu/fac/lpress/devnat/nations/Bangladesh/bdmosaic.htm, accessed 23 June 2004.
http://www.bangladeshobserveronline.com/new/2004/01/24/it.html, accessed 15 May 2004. Rahman, Sayeedur (2002). Internet in Bangladesh, at http://www.e-mela.com/ computer/InternetBD_122202.html, accessed 21 June 2004.
http://www.thedailystar.net/2006/05/22/d6052201033.htm, accessed 06 June 2006. University of Rajshahi: A Profile (2006). An official document published by the Registrar, University of Rajshahi, May, p.5.